MessyJesse - a quilt blog by Jessie Fincham: English Paper Piecing Basics: Week 1 // A Little History, Supplies + A Giveaway! 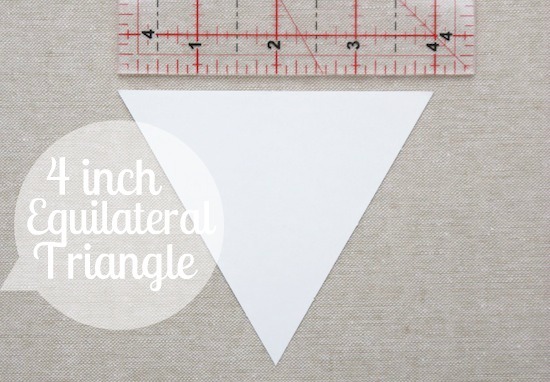 English Paper Piecing Basics: Week 1 // A Little History, Supplies + A Giveaway! Hello, and welcome to our first week on the basics of English Paper Piecing! I'm hoping to cover a range of topics to help you with your English paper pieced projects. There will be step-by-step tutorials, inspirational ideas, free patterns and more, I'll be posting each Monday for the next 10 weeks or so - I have to get organised and sort out the finale schedule ;-) so I do hope you'll join along with me. English paper piecing (EPP) has become oh so popular again in recent years, which I for one am really happy about! It seems so often in quilting and life in general nowadays, to speed everything up. Don't get me wrong there are lots of times when I want to do just that, and if there are new tools or methods to make the lives of us quilters easier, then I'm all for it! Also I know not everyone has the luxury of endless sewing hours but I love the contrast of hand sewing and watching a quilt project grow and develop over time; enjoying the slower pace and process. So, What Is English Paper Piecing? Well, in short - it's an age old technique that is used to make quilts by hand. Fabric is basted over a pre-cut paper template and then the templates are sewn together to form a quilt. Sounds simple, yeh? When you think of English Paper Piecing; sometimes known as 'mosaic patchwork', hexagon quilts usually spring to mind, largely because It's the most popular and predominantly used shape throughout the history of the craft. The hexagon pattern originated in England during the 1700's and became a popular design in both Europe and the U.S. during the last quarter of the 18th century - when all thing's English became highly fashionable. Apparently this is how the name 'English' Paper Piecing was coined, it was a marketing stunt! The most recognisable of all EPP patterns; the Grandmother's Flower Garden rose to popularity in the 1920s and 1930's most likely because it can be made easily with scraps, which was so important during the Depression of that time. You can often still find antique EPP quilts with the paper templates intact, which were recycled from books and documents. So the first couple of posts in our summer series is about getting started, for which you need materials! The great thing about EPP is that you really don't need much to get going. 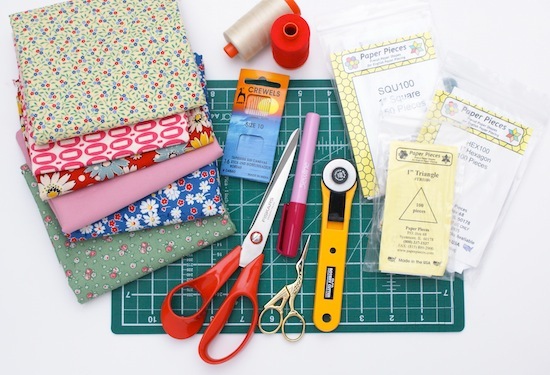 Above are my personal favourite's and tools I use for EPP but by no means is this a definitive list - swap and change to adapt to your preferences and sewing kit you have on hand. First up you'll need some fabric to chop into! There is a vast supply of 100% cotton quilting fabrics available to us now, so take your pick! When choosing your selection keep in mind the importance of value; you'll need a mix or light and dark fabrics to really make your quilt projects stand out. If you want to try fussy-cutting, look for fabrics with a good repeating pattern (if you have no idea what I'm talking about - don't worry fussy-cutting will be covered later in the series!). You may also want to pre-wash your fabric before starting to test for colour-fastness and allow for shrinkage. My personal choice of needle is a Gold Eye Sharps. Size 11. though remember that the thicker the thread the thicker the needle required, so keep that in mind depending on your thread choice. I use Aurifil 50wt thread for hand sewing, it's a lovely fine strand so it glides through the fabrics well. However I have heard from the lovely Florence; an avid EPP'er, that she has recently tried Superior's Bottom Line, a strong polyester thread which apparently rarely tangles - so I'm hoping to test that out soon! Small scissors are vital for snipping threads as you work through a project. You'll also need some paper scissor's if you choose to make your own paper shapes. I like to use my rotary cutter to cut fabric shapes ready for basting, I find the smaller 25mm size is ideal. Though you can use fabric scissors for cutting if you prefer. And a cutting mat of course! You may also want to try out the Sewline glue pen, which has set the quilting world abuzz since it's release. You can use this instead of hand-sewing the shapes (we'll talk more about that next week), so it really speeds up the process and allows you to crack on with the fun sewing - sewing the shapes together of course! 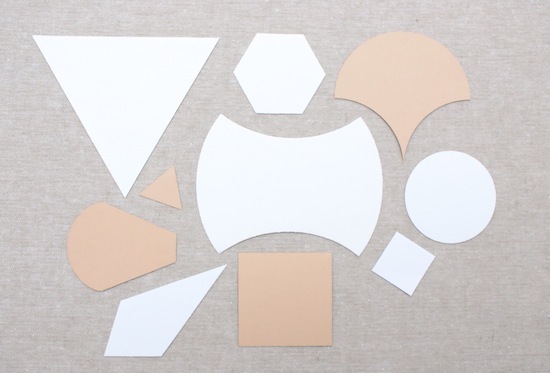 And last but by no means least, pre-cut paper piecing templates. We sell a large range of these at Sew and Quilt, and they are certainly my preferred method. I have made my own shapes in the past which was fine, but I soon realised it took up so.much.time. and not fun crafting time - cutting time! Being a leftie, it really wasn't an enjoyable part. I also know when I'm using the pre-cut paper pieces they are die-cut so accuracy is spot on, which is critical for EPP. Pre-cut paper pieces are sold in various sizes to suit your design needs. Geometric shapes are measured by measuring one of the equal sides. This hexagon below is the 1" size. With the curved paper pieces we measure these slightly differently, they are measured across the diameter. The apple core shape below is the 4" size, and the clamshell is the 3" size. Almost any shape can be used for EPP, a wide variety of shapes in various sizes will fit together just like a jigsaw so the opportunities for creating individual pieces of patchwork is unlimited! You can finish a quilt made entirely of interlocking shapes or combine completed blocks with needle-turn appliqué to create endless possibilities for design. We'll go through step-by-step ways on finishing EPP quilts later in the series. So I figured what better way can I kick off the new EPP summer series than to offer a giveaway for some English Paper Piecing goodies! 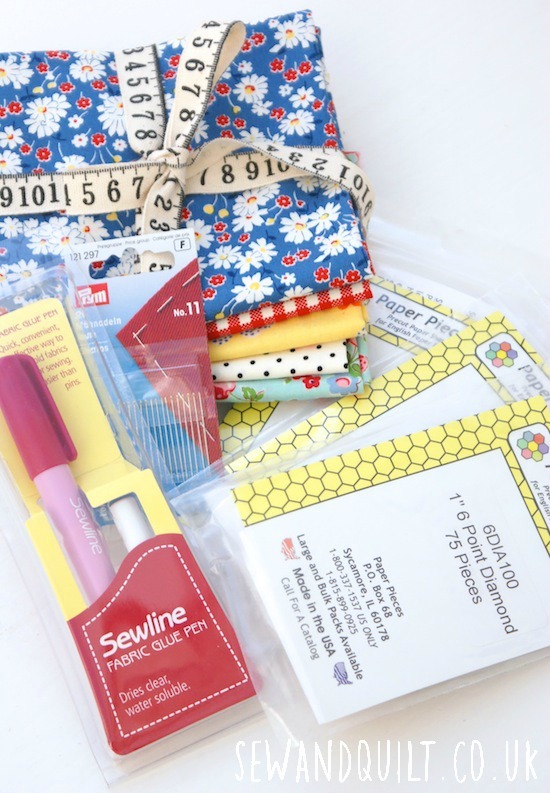 This is a fantastic starter pack of supplies from my shop Sew and Quilt. One lucky winner will receive a selection of five fat quarters, three packs of Paper Pieces and some needles to get sewing straight away! Oh and a Sewline glue pen! For your chance of winning leave me a comment on this post telling me one (or more) things you would like me to cover during the series / or what EPP project you are working on. For additional entries please share this on any of your favourite social media sites; Facebook / Twitter with an additional comment for every share. You can also find me on Instagram @messyjesse1 where I will be offering an additional entry. Winner will be announced on the blog next Monday 28th July 2014. Competition closes Midnight Sunday 20th July. International entries welcome. Next week is all about the humble Hexagon and getting started! Hope you can join me! Have a great week. I am currently working on a double wedding ring quilt in liberty scraps. You actually inspired me to start it and it has been great so far. I want to know if you can reuse the paper templates with the glue pens. I always baste my templates in with a needle and thread, so am intrigued by glue! I want to learn about double wedding ring, and pickle dish patterns! Fussy cutting! I love what people create with it but I struggle to know where to start without wasting fabric! I've done a little EPP and my stitches always show on the front. :( So I'd like to know the basic skills such as thread, needle and stitching. Currently working on two projects, one is a hexie quilt I started way too long ago but as a new year resolution in Jan I vowed to try and complete it this year. Second is a hexie pillow, I made it ten years ago but recently picked it up again to repair my stitching that has come undone. I would love to see you cover some fast projects like a teacosy! I have an EPP project that I started at FQ Retreat 2 years ago, I rarely hand sew but now that summer is here I'd love to sit outside with a portable project rather than at my machine! So for me a covering of the basics would be great! I'd love to know how to tackle the curved pieces. I just can't fathom how to go about it! I've sewn EPP hexies, diamonds and triangles but the curves have me stumped! I've never tried EPP so I'm looking forward to this. I'd like to try my hand at hexies. It was one of my new years resolutions to make some and still haven't so now is probably the time to try. I do a lot of EPP, but haven't tried theglye pens, so would be interested to hear how you get on. Strangely, I was just doing some research on them! HI, the only EPP I've done was 6-6" Tulips for a spring wall hanging! 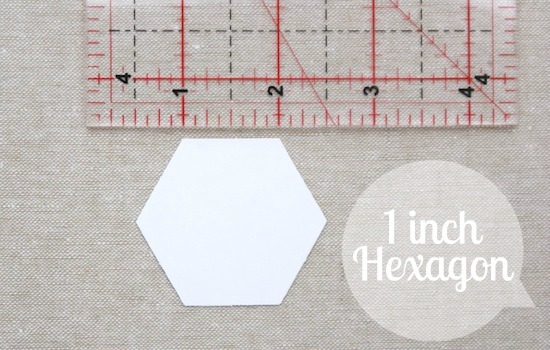 Just found your Blog+I'm going to do some Hexies too! I'd like to see tutorials on doing the diamond! Thanks for sharing a neat Giveaway too! I adore epp! I have very nearly finished my first quilt top and am so proud of it! I'm working on a clamshell panel for a quilt showing the Thai night markets. The clamshells represent a wonderful display of parasols. Being completely new to EPP I'm looking forward to learning all the basics. Thanks for the giveaway! I haven't done any EPP, so I am ready to learn everything about it. I've only done hexagons - I'd like to try curves !! I have started a EPP hexi quilt from Anna Maria Horner scraps. I love it but I have not been using the glue. Can't wait to get some. Also, I would love to know how to sew so my stitches don't show. Thanks! I have a basket all set up with different sizes of hexies and fabric pieces, so I can keep my hands busy while watching TV. I would like to learn how many stitches are needed when sewing hexies (or any type of EPP) together. How far apart? How do I make them so they won't show, or is a little bit of thread ok? Thanks! I can't WAIT to keep following along! I have shared on twitter! Fussy Cutting for paper piecing and How much fabric do I need for that shape!!! Thank you for this giveaway and this series. I am very new to EEP and am excited to learn more about the basics. In particular I think it would be helpful to for me to have a better method of sewing the pieces together than the method I used previously, because my stitches showed through a little on the front. I am also interested in how stitching the other shapes works as I have only done hexis. Thank you again! Everything! I've never paper pieced before and am excited about learning! I'm working on an hexie miniquit for a friend! I'm following you on IG! 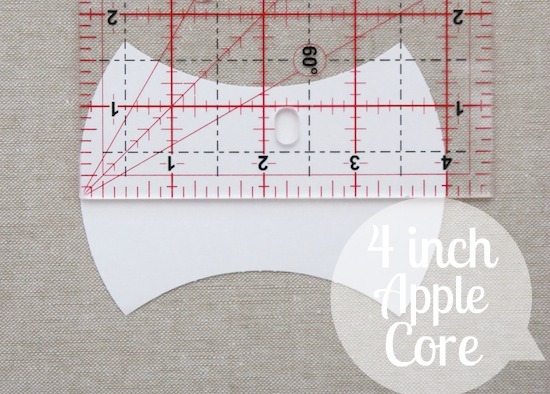 I've been wanting to make an apple core project, but I'm a bit worried about putting the curved edges together--I'd love to see your take on those! I just started making some hexies, but I have never sewed them together. Some advice about that would be helpful. I'm curious about choosing a color to sew two contrasting pieces together. My stitches still show a big so this is a bit of a challenge. I have never done paper piecing....I am sooooo excited to learn tho....not sure what to ask your to cover...just willing to follow your directions to the finish! Yay! I am very happy that you are doing this series. I have done a few small projects with half inch hexagons (pillowcase and bed spread for a small doll bed). I am anxious to learn more about different shapes of EPP. Havent done any paper piecing for awhile, but maybe your posts will inspire me. Id like ideas about what to do with Suffolk Puffs. I have done hexies and right now I am using 1/2 inch for a small needle case. I would love to try some new shapes. Thank you for all your hard work and thank you for the chance to win. Hi Jessie! Thanks so much for getting this started! I only worked with EPP once and I was a bit discouraged at how visible my stitches were when I started putting my hexes together... will you be going over joining the pieces together and whether or not it is normal to see stitches? Thanks for the chance to win! =) What a lovely way to get started! Great idea for a blog series! I'd love you to cover piecing curved shapes together as they still intimidate me! I would love to learn about fussy cutting, it is so marvellous all the quilts out there. I'm looking forward to this series about English Paper Piecing! I have just completed a Grandmothers' Garden quilt and am currently working on a 6 point diamond quilt. I shy away from curved shapes so would love to see how to work with them covered in the series. Hello, thank you for your comments and tips on EPP. So far I've only tried hexagons but I would love to go on making projects using this technique. I would really appreciate to see a clam shell project here because I don't really understand how to make them since I haven't found any good tutorial on the Internet. Thank you very much for the giveaway! I can manage straight lines, but I'd love to know how to stitch curves. I would love to see how to take the papers out after everything is sewn together. Thanks! I adore epp and would love to hear more about how to finish projects since the shapes make don't make a true square. Thanks for the chance! Curves would be useful - and about waxing thread to make it not twist? I have only done a small amount of EPP but I do enjoy it though I am not very accurate. I would like to guive it a proper try again one day! I am in a group that swaps 2 1" hexies each month so I'm always working on those. I agree with some of the other posters about wanting to see curved pieces used. I have been wanting to do hexies but, have been a little hesitant in starting. I would love to learn more about using the glue pen. Thank you for doing this series. I have a hexie project if the go at the moment, making slow progress! I am keen to learn about the glue pen and tackling curve peices. I'd love to know about joining the pieces together. Is there a way to hide the stitches? Thanks for doing this! What an informative first post - thanks you! If the rest of the posts are like this then I am sure everything we need to know will be covered :) I would be grateful though to know of any books you recommend for beginner quilters to help them get started. Looking forward to the rest of the posts. I Facebook shared this contest! Right now I 'm working on my first English paper piecing quilt from Wild Olive's stitching club. Loving it and eager to learn more about EPP. I'm looking forward to this series to brush up on my EPP, been a few years since I have done any, maybe I will get inspired to finish one of the started projects! I do not see my original message so will assume it did not post. I cannot sew a button without some sort of problem. I have been wanting to learn how to quilt but have no idea how to even start. Please continue to be as detailed as possible. I can't wait to read more. Thank you. I am making a hexagon tea cosy. Some one mentioned in their blog the lovely ones in the drawings in the Brambly Hedge books, an so I started on one of my own immediately, as I love making tea cosies, and hexagons, and I love those books. Thanks for the lovely give away, and this series. How do you glue baste EPP? I'm new at this! Hi, I'd like to learn different ways of finishing off a hexagon quilt, since they are not straight lines. Looking forward to this series. We're starting our summer holiday in Cornwall today and I'm bringing my ongoing EPP project with me. This will be a long grandmothers flower garden in making, hope to finish it soon. I am so tempted to try this. Looking forward to your tutorials. I love EPP. Little hexagons,fabric,needle and thread, a nice shadow what else do I need to have a great afternoon.I would like to try apple core and clamshell sometime,so a tutorial on them would be handy.By the way this might interest you:http://cadouri-din-inima.blogspot.ro/2013/01/tips-for-cutting-hexagon-templates.html.Thanks for the opportunity. Love epp! I've been addicted to making stars for about 5 years now. My quilt is 3/4 of the way done. Love that you're helping others learn to make these. Thanks for doing the giveaway. I'm not familiar with using glue with epp. I know close to nothing about EPP so I'll be grateful for anything you can share. Thanks! I am not sure if I am doing the EPP version but I have been paper piecing some small fronts for some pincushions that I will donate for a local charity fundraiser. I loved reading through your post. And signed up for your newsletter so that I can keep up with these posts. I shared this post on FB as Kathy Newsom Davis. I've never done any EPP before so covering the basics would be good for me. Also shapes other than hexagons. I'm a newbie quilter and have everything to learn about EPP! Thanks for the chance to win! I'm a complete newbie to EPP so all basics would be great! And I'd love to see some non-traditional ways to use EPP! I have been working on a small hexagon quilt for quite some time. I start then put it away and now I am just plugging away at it to get it to a decent size. I know absolutely nothing about EPP, but I'm always up for learning a new skill. My stitches are still not that good. So what is the trick? How to keep them tiny and perfect? I've never done EPP before but would love to follow along and learn. Thanks for the great giveaway. I have done few projects using EPP. I have just started a quilt using two inches hexagons to take with me on holiday next week. 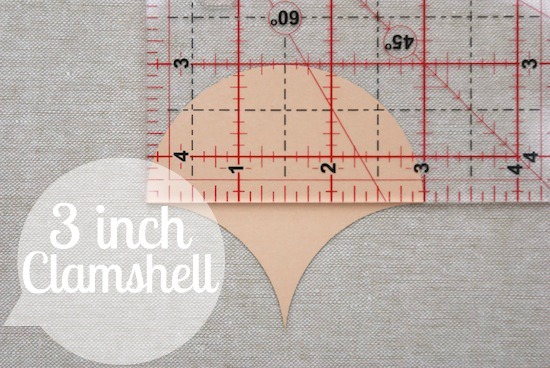 I would like to find out how to stitch curves shapes using EPP. Thanks for the chance of winning your giveaway. Oo this sounds like fun and just in time for me; I've been itching to learn English paper piecing recently. I absolutely love fussy cut patterns. I've seen a load online and they look great. i think i have the oldest incomplete hexie project in the world. started circa 1971 it may also be one of the ugliest, it has a piece of my old school tie in it for heavens sake ! i began it before i knew anything about patchwork and before there was anywhere much to look for information. i know i will never finish it but i can still sigh over it from time to time and admire my tiny stitches. it's time for another go, with fewer weird fabrics x thanks for your lovely post . I am so excited about this series! I just returned to EPP and am working on a hexagon flower pillow this week, love the slower pace sometimes. I have been making 1" hexagon flowers (thanks for showing how to measure them!). I'd love to see what you do when it's done! How you prep for quilting etc. I'm a bit terrified of that once it's done. All that hard work sewing and I don't know what to do when I'm done! Thanks for the chance of the generous giveaway! I have used hexagon paper piecing but never the diamonds or triangles. How do you make stars with paper piecing? Is it awkward to work with the material and papers? How does the material fold around the papers on those awkward shapes? Thank you for a chance to win. I would love to push myself and try a different paper piecing shape! I am so excited about your EEP series! I love the look of EEP and look forward to doing a Grandmother's Flower Garden Quilt. I have two of my Great Grandmother's quilts that were done using EEP piecing and I treasure them. Everything was done by hand even the quilting. I hope your series includes how to connect the paper piecing and finish out your quilt. Thank you for the lovely giveaway! I would love to learn how to make the pickle dish pattern. I also want to know, if you do t baste the paper to cloth part of the EPP, but glue instead, when do you remove the paper from the back? I love EPP, but have only done hexagons, I would like to do diamonds, but wonder how to make the corners flatter and neater. I am currently working on a Grandmother's Flower Garden using all Japanese prints! I have never done EPP, so I'm really excited about this series! I've just started a EPP star quilt and so tips on how to speed up...how many stitches per inch?? Curve piecing would be very helpful. Thanks for the giveaway. Just discovered your site and and am looking forward to your lessons. I made a table runner so understand the basics but am interested in tips and suggestions on other projects. I especially would like to see how you stitch the pieces without having your stitches show on top. That's what I am trying to perfect. I would like to see your tips for stitching the pieces together - hiding the stitches, matching points and any other hints you might have. Just found your blog and I'm glad I did! I'm in the middle of my first EPP project - a 6-point diamond quilt for my mom - and I'm loving it! The one thing is like to know more about is how to create partial "blocks" for finishing up the sides of the quilt. Also, I hadno idea you could EPP clamshells! I'm intruiged and will be following along going forward. I have never done an EPP project before, but I'm super interested in learning and trying it out. I would like something other than just hexagons - I've done hexagons and they seem easy, but I haven't tried curves and I'm guessing that they're harder, so maybe something on those. I would like to cover doing these without the glue. The part where the ends aren't tacked together leaving the bulky ends. I hope this is clear! How do you cover the templates and join them together? I have started my first project and need help. The blog was absolutely fantastic! Lot of great information which can be helpful in some or the other way.This is so creative mosaic products .. Keep updating the blog, looking forward for more contents...Great job, keep it up..